It sounded straightforward: “What should be our scientific strategy? Where are the opportunities? And who should we be bringing to the CSC to help us with this?” Clear goals from the CSC’s Matthias Merkenschlager, co-organiser, along with Oliver Howes, of a unique workshop earlier this month. What followed was anything but straightforward. 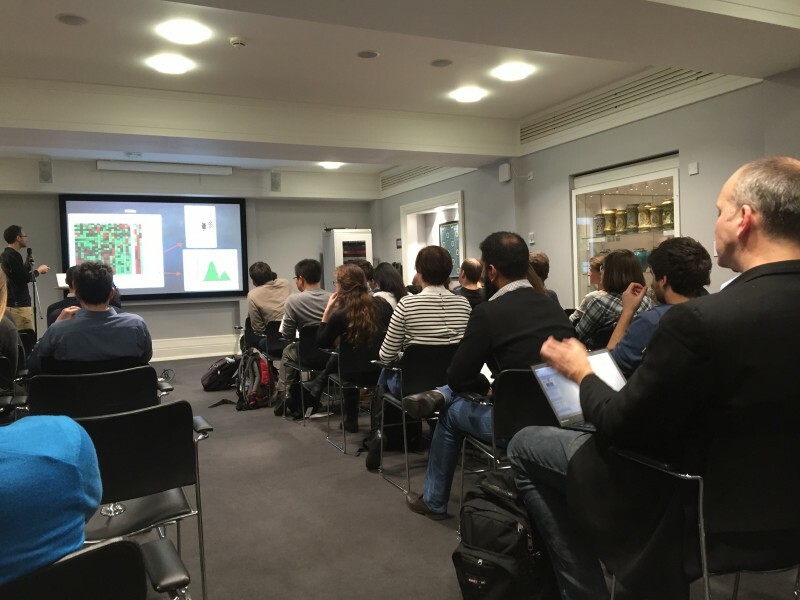 Attendees found themselves on an exhilarating two-day journey through the very latest thinking in experimental and computational biology. This began at the Wellcome Collection in central London on the evening on Friday 4 March, followed by a series of talks the following day at the CSC’s home at the Hammersmith Hospital campus of Imperial College. Groups working on Integrative Biology (IB) have reached a critical mass at the CSC. Late last year, a new IB section won strategic backing from the UK’s Medical Research Council, to bring to bear both experimental and computational methods in tackling scientific questions. The workshop served both as a celebration and as a way of looking to the future, including bringing in new groups. Andrew Pospisilik talks at the Wellcome Collection on the impact of paternal diet. With the intriguing backdrop of the Wellcome medical collection, scientists first heard from Nikolaus Rajewsky of the Max Delbruck Centre (MDC) in Berlin and Stuart Cook of the CSC. Rajewsky talked about his work on circular RNA, which he has found in surprising abundance in neurons. He discussed the joys of “droplet sequencing” as a method he claimed can provide sequencing data some two orders of magnitude cheaper than current techniques. Stuart Cook described his quest to understand a paradox: namely that some one per cent of the world’s population carry a genetic mutation known to be linked to heart disease, with no apparent effect. The key, he thinks, is that the hearts of such people may be “primed to fail” if they suffer a second hit, whether genetic or environmental. By his reckoning, there are some 30 million people in this position globally; a potential target group, he said, for preventative drug approaches. On Saturday, Jan Korbel of EMBL Heidelberg, spoke about his work on structural variation in the genome. He has devised efficient ways to map structural variation, and suggests that structural alterations that cannot be explained by gradual mutational change could instead be down to chromosomes being shattered, then repaired, during the cell cycle. He spoke too about rapid advances in the speed of genome sequencing, and its plummeting cost. He said re-working by the Pan-Cancer Analysis of Whole Genomes (PCAWG) has allowed his team to pursue fresh research lines, but how to store and manipulate the volume of data this generates is proving one of his biggest challenges. “Many of us who are using large datasets will be hit with the need for outside resources”. He’s exploring the use of hybrid cloud computing set-ups, making use of an Amazon service. He proposed further thought about the need for a Europe-wide cloud computing service. Fyodor Kondrashov and his video of evolutionary fitness at the CSC workshop. After lunch, Lucas Pelkmans, of the University of Zurich, described his work on predicting transcription abundance in cells. In a recent paper in Cell, he showed that variation in gene expression between cells is not “stochastic” but can be predicted, based on features such as size and shape. He also showed that the cell nucleus acts as a kind of buffer: that transcription happens in bursts with transcripts staying in the nucleus for a while, then released to the cytoplasm slowly, keeping RNA levels in the cytoplasm relatively constant. Fyodor Kondrashov, of the Centre for Genomic Regulation in Barcelona, showed what he described as “the first video representation of a fitness landscape of many, many genotypes.” Kondrashov, who has an EMBO Young Investigator Award, described new ways to visualise the process of evolution, and how it changes with context. Petra Hajkova of the CSC on the latest in epigenetic landscapes. Several CSC scientists presented their research during the course of the workshop: David Rueda described his use of cutting-edge microcopy techniques with single-molecule resolution to show how an enzyme crucial to keeping our immune system healthy “surfs” along strands of DNA inside our cells. Boris Lenhard talked about the organisation of regions of DNA, for example showing the genome regulatory blocks (GRBs) and topologically associated domains (TADs) show a similar distribution, and that GRB boundaries predict TAD boundaries across cell types. Irene Miguel-Aliaga described her work on the sexual identity of our organs, using the fruit fly model. Simona Parrinello talked about mechanisms behind the behaviour of glioblastoma cells in brain tumours. 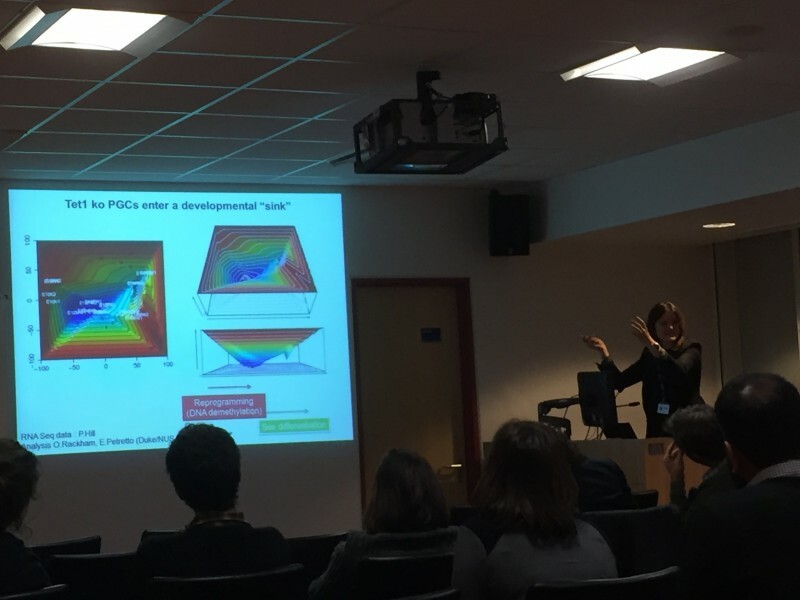 Silvia Santos presented a story on a newly found strategy used by cells to control the time at which they divide, combining quantitative experimental approaches and mathematical modelling. Andre Brown described his work with nematode worms, looking for observable changes in phenotype after exposure to a drug that might indicate the mechanism of that drug. And EMBO Young investigator award winner Petra Hajkova drew the meeting to a close with a talk on epigenetic memory in the developing embryo. Amanda Fisher, director of the CSC, summed up the spirit of the two-day gathering: “It’s such a great chance to ask all these talented young scientists what they think we should be doing in the future.” And with talks ranging widely from the very experimental to very theoretical, there proved fertile ground for discussion and debate. Excited conversation filled all of the breaks, and there was barely enough time to finish the programme. One scientist said the experience left them with a “scientific hangover” the next day; a feeling of having consumed so much, and being left a little overwhelmed at the prospect of further scientific endeavour. 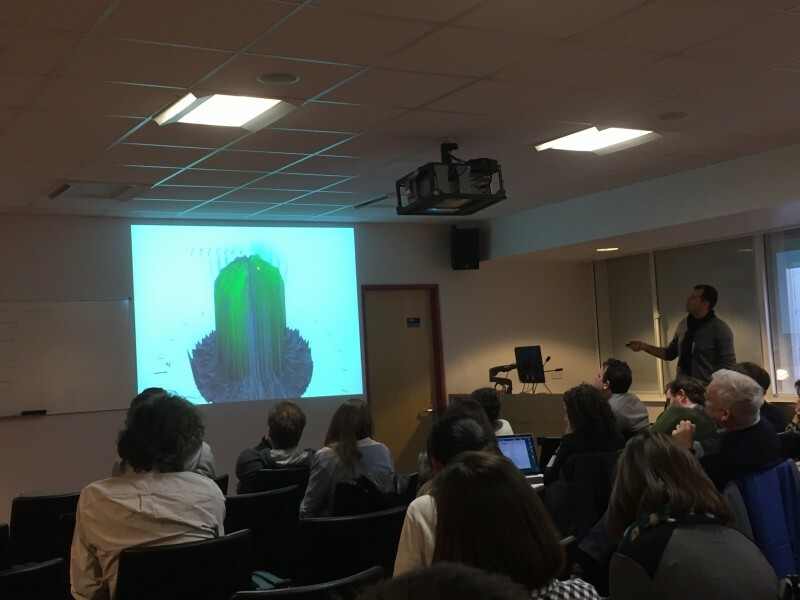 For co-organiser Oliver Howes, the workshop showed the value of quantitation, as well as the importance of developing ways to handle increasingly large datasets and linking these to robust experimental testing. “Integrating the experimental and the computational is the next challenge, and future recruitment at the CSC and elsewhere will reflect this new frontier,” he said. There was strong agreement that the workshop should be repeated to monitor progress. For some, the two day’s of talks showed just how much has changed in the couple of decades since Sir John Maddox raised concerns over a lack of a quantitative future for biology, and began to sketch out the very much quantified journey that lies ahead.